Every musician needs a basic tool kit for setting up and adjusting electric guitars and basses. The Fender Custom Shop Tool Kit makes it simple with a convenient collection of the most essential and commonly used tools—specifically designed for electric instruments. 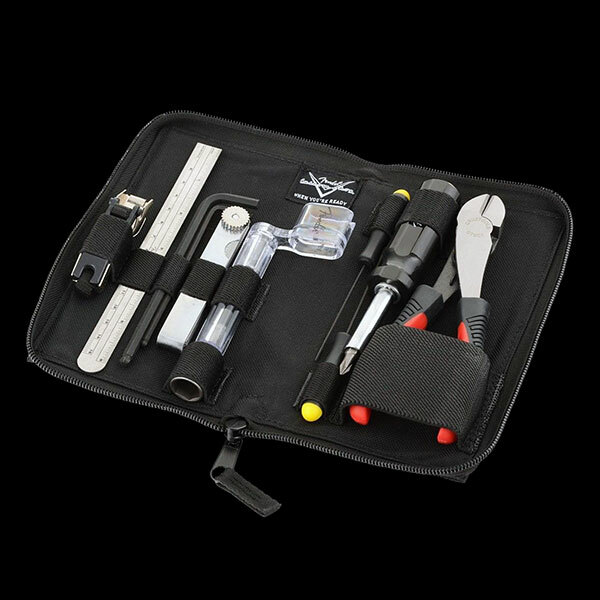 This kit contains all the basics for most minor adjustments, including a five-in-one screwdriver with a special 4-mm hex adapter for truss rod adjustment, telescopic adjustment mirror, ruler, diagonal cutter, capo, feeler gauges, and string winder. These are the same high-quality setup tools used by the pros, and everything is stored in a convenient polyester pouch that fits easily in your case or gig bag.